Scoping out the room at the Hunter Presbyterian Church Fellowship Hall, every single participant’s expression and tone of conversation rang to their passion to bring environmental justice to their community and to Appalachia. We were overwhelmed by the sense of community in this room. 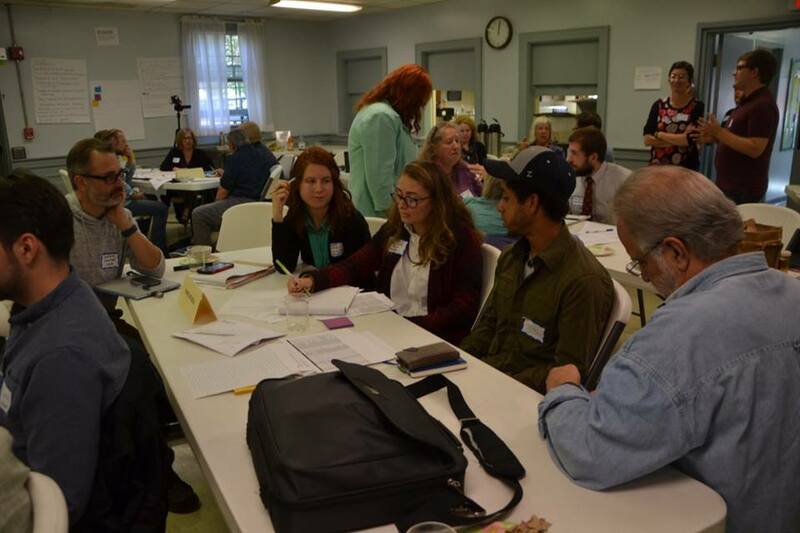 All sorts of people were attending, including but not limited to, lawyers, herbalists, professors, college students, and anthropologists, all of which comprised a coalition of activists collaborating at the first planning meeting for the new Appalachian Land Ownership study. Over 65 individuals from Tennessee, North Carolina, West Virginia, Kentucky, Virginia, and Canada gathered in discussion about a collaborative design process for carrying on the original land study in the midst of new comparative data and knowledge sharing technologies. What the goals/vision of the new land study are? Why is this land study important? With this report we highlight the origins of the land study, the present social and political context in the region that could influence the outcome of the project, and most of all, the imperative for transparency between the state, the academy, and the people. 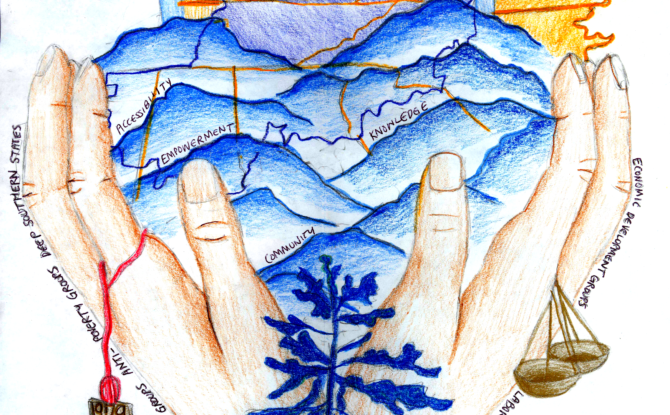 In 1979, the first Appalachia Ownership Land study was a collaboration of activists, scholars, and Appalachians to determine who owns Appalachia. Discourses of activism, community organizing, and academic research ensued with different goals and definitions in regards to land ownership and use in a post-coal transition. 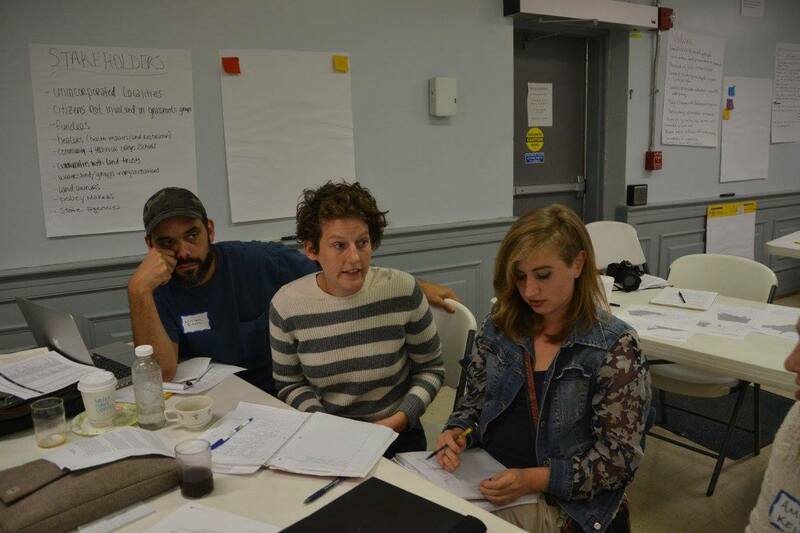 With that in mind, in the September 30th meeting, these three dynamics were brought together to discuss the first steps to creating a community-based participatory movement. The original land study’s findings emphasized taxation, especially of mining corporations owning mineral rights. One issue was that corporations and absentee owners were paying low tax rates for both land and minerals. This reflects the lack of information available to citizens in affected areas. Important information about the land is not publicly accessible, if it even exists at all. Why is this new land study important? In the post-coal realm, updating the Appalachian Ownership Land Study is vital for answering “who owns Appalachia?” in order to regain the land lost economically and environmentally to the coal industry. The coal industry has left a legacy of pollution, health risks, and liabilities. They need to be held accountable so that they are in the public eye for their wrongdoings. 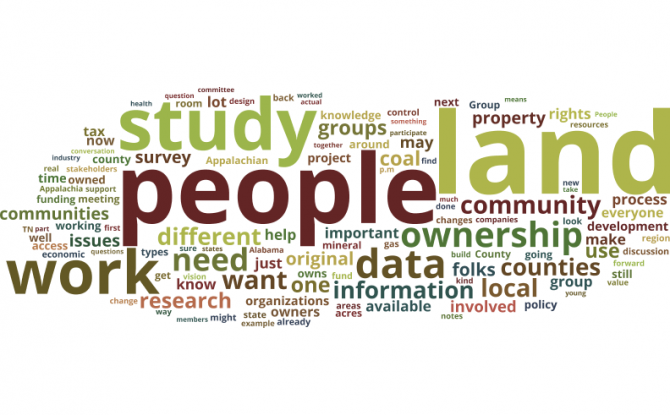 Fragmentation of land, absentee landownership, questionable land ownership/boundaries, and unincorporated towns, among many other issues call for the need to collect data on land ownership as well as making that data accessible to all. Participants were asked to share the information they believed needed to be collected and what should be done with that knowledge. Several subjects that came up involved the difficulties of mapping land ownership due to discrepancies in land surveys, such as the acreage not being measured accurately, and bankrupt land still being owned by the corporation. The new study is paving the way for restoration and transparency. Dr. William Schumann, a graduate professor in Appalachian Studies at Appalachian State University, brought up an interesting point. “Mobilize this to plug into policy discussions. Make it comparable and connect it to other resource extraction issues” says Dr. Schumann, in regards to project design and outreach. This hints that there should a clear stance in the top priorities, like reinserting local voices, but also framing the work in a way that speaks to bureaucrats, and also speaks to the state with human stories. The last group discussion was about who and what was under-represented at this meeting and in the study. In the spirit of collective activism, and the current social movements taking place, being able to connect the environmental justice fights happening across the nation and the world seemed extremely vital to the legitimacy of this project as well. Karen Rignall, a Cultural Anthropologist and professor at University of Kentucky, explained her work in Morocco regarding land ownership, saying that there are “…commonalities of land struggles all around the world”. This study is not only a fight for Appalachia and the deep South in a post coal transition, but, is in the forefront of a groundbreaking, nationwide, revolution to take back the land. Overall, from reflecting back on interviews and photos, after this quick but foundational meeting, there seemed to be a fire lit in each and every participant. All members were ready to take back what they learned and ignite a fire in their communities. What are some of the things the community can do? What is the immediate call to action? Assembling the data already out there, already accessible in each region. Go find and digitize what is missing. 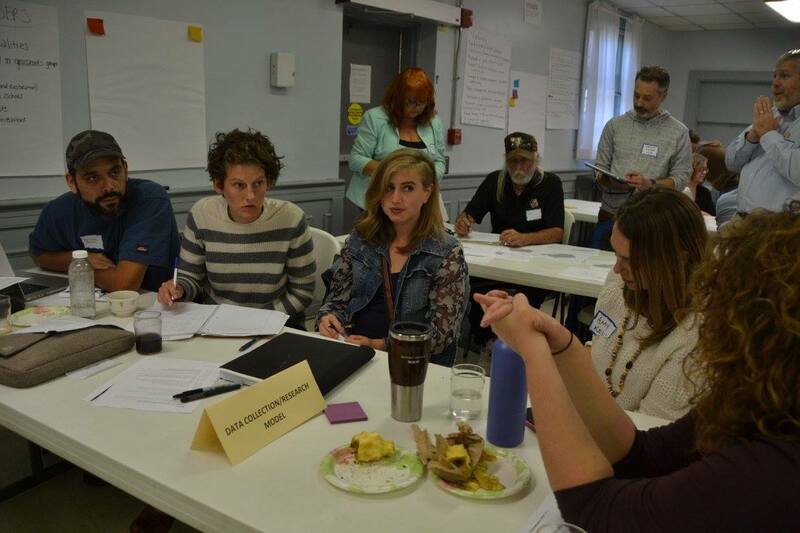 What did the meeting’s participants want the land study to accomplish? In July 2016, over 10,000 citizens took to the streets of Philadelphia, PA to participate in the March for a Clean Energy Revolution, where one of the demands was for the Protect Our Public Lands Act (POPLA). If passed by the U.S. Congress, this Act will stop all hydraulic fracturing (fracking) on U.S. public lands. POPLA arises during a time when the U.S. Energy Information Administration projects that U.S. natural gas production – in large part a result of the use of fracking and horizontal drilling to access previously inaccessible gas formations – will increase by 55 percent by 2040. A report recently released by Oil Change International confirms that this will lock in enough carbon emissions to bust through agreed climate goals, signed by 178 nations in the Paris Agreement. At the same time, July 2016 was the hottest month in recorded history, the 10th record hot month in a row, according to NASA. Communities around the globe are already experiencing the effects of a changing climate and more extreme weather events, from loss of fishing and water resources, to observed changes in the timing of seasons, to, in some extreme circumstances where places are becoming unviable to maintain livelihoods and settlements as the land disappears underneath due to sea level rise, coastal erosion, and melting permafrost, being forced to relocate. Indigenous, frontline communities are among those observing and experiencing these impacts first and foremost. According to the U.S. National Climate Assessment, “[t]he consequences of observed and projected climate change have and will undermine indigenous ways of life that have persisted for thousands of years.” Many of these communities are the same ones that have already been – and continue to be – sacrificed by the extractive industry. In this context, the idea for the Protect Our Public Lands Tour: For a Just and Renewable Energy Future arose out of a partnership between colleagues and friends from the Livelihoods Knowledge Exchange Network (LiKEN), Food and Water Watch, Paper Rocket Productions, the Native American Producers Alliance, the Kentucky Environmental Foundation, the Intertribal Council on Utility Policy, and the Permanent Peoples’ Tribunal on the Human Rights Impacts of Fracking. 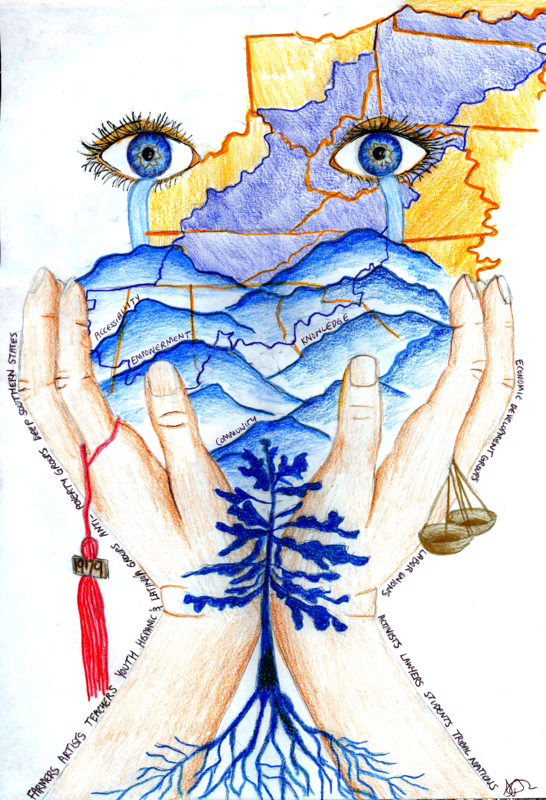 Twenty-four Indigenous and non-Indigenous advocates, activists, and community workers of all ages – from youth to elders – and diverse tribal and community affiliations, caravanned across the United States on the tour. 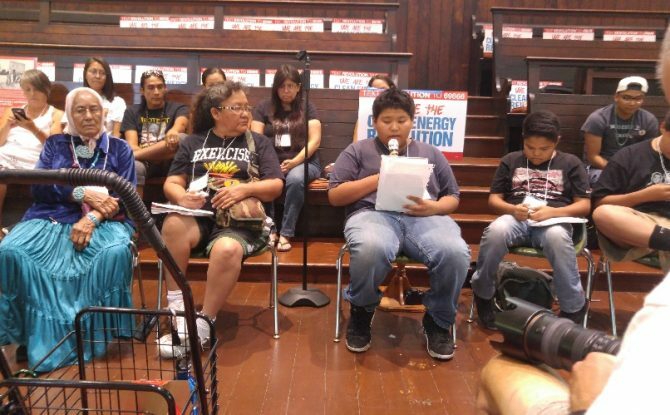 It was envisioned to bring Indigenous community members to Philadelphia to speak at the Summit for a Clean Energy Revolution, for experts and activists to come together to create solutions to stopping fracking and dirty energy processes, and to participate in the March to build the Clean Energy Revolution. More than about a single destination, the journey was also intended to learn from the stories of frontline community members working hard to transition from toxic energy industries to a just and renewable energy future. A creative process to build public will, coalitions, and empowerment for people working at the grassroots level to communicate their work, vision, and process through story-telling, film and social media, by translating their work and the issues they have been battling from their places on-site to people from other communities and cultures. Strengthening and igniting networks and communication pathways between: Native American activists across tribal nations and regions; Native and non-Native advocates and workers across other frontline communities and regions (e.g., Appalachia); frontline environmental justice communities and mainstream environmental justice activists. Helping to inform the transition movement from fossil fuels to clean energy and renewables about the need for a just transition, which includes past injuries from the fossil fuel industry and other historic traumas and injustices, so that history does not repeat itself and the same communities who have been the fossil fuel sacrifice zones are guiding the effort to understand what is needed to create ajust transition. Paper Rocket Productions, a Navajo/Hopi film crew who mostly grew up in communities affected by fossil fuel extraction and raised by families fighting for justice, filmed the tour, as we traveled together to experientially learn from each other, from the site where Navajo activists showed us where they stood their ground against the development of a the Desert Rock coal-fired power plant in their community, a Nation that is already home to the health and livelihood impacts caused by dozens of coal and uranium mines and thousands of oil and gas wells; to being gathered outside the New Mexico Bureau of Land Management office in Santa Fe, as Kendra Pinto, a strong, young Navajo woman on the tour, asked, “how are our lives not important?”, depicting the witnessed devastation to her community the prior week when an explosion at a fracking site near her home caused six new and 30 temporary storage tanks to catch fire and forced dozens of families to evacuate, leaving them with only 30 minutes to gather whatever they could. We stood together at Lake Thunderbird in Oklahoma, where Absentee-Shawnee community workers and activists who were part of the tour showed us where they are resisting yet another pipeline – Plains American Red River II Pipeline being laid across their sacred land. This was the same place where their ancestors’ remains were dug up and dumped into a mass grave after the U.S. Army Corps of Engineers flooded the land in the 1950s to create a lake reservoir, with tribal residents’ houses washed away and entire families forced to move. We traveled to Ponca Nation in Oklahoma where Casey Camp Horinek, a long-time Native rights activist and cultural practitioner, and her son Mekasi informed us about the contamination flowing into their community by the fossil fuel industry in all directions. This strategy – of journeying, witnessing, and experiencing together to create platforms and support frontline community members tell their stories of historic trauma and current injustice – is working to build both local and national awareness and demonstrate the needs for embedding justice into the transition to a clean energy economy. It is not an isolated practice. 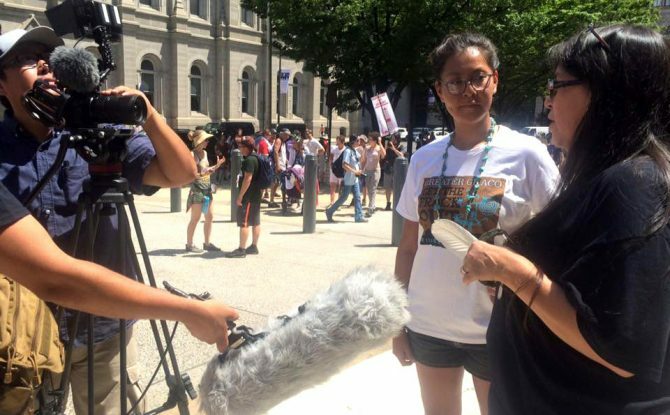 For example, while the POPLA Tour crossed the country to Philadelphia, Lakota youth from Standing Rock in North Dakota ran 1,500 miles to Washington, DC to protest in front of the White House against the $3.8 billion Dakota Access pipeline, which would carry half a million barrels of Bakken crude from North Dakota to Illinois, threatening their water sources, land, and health. Ava Hamilton with the POPLA Tour, participating in the March for a Clean Energy Revolution. Philadelphia, PA, July 24, 2016. Photo by Susan Rose. How can we work to create and share an open space for frontline communities in sacrifice zones who are deeply suffering from historical trauma and continued atrocities wrought by the fossil fuel industry to have their voices heard and work to ensure that the same injustices are not continued in the post-carbon transition? How could such stories be leveraged to build awareness, knowledge sharing, and solidarity across cultures, communities, regions, and even nations, to infuse environmental justice into the transition to a post-carbon, clean energy economy? empowerment and justice for the present and future – for all generations and relations now and for those to come. A common way to explain something often starts with, “Let me tell you a story.” Storytelling is one of our oldest and most basic forms of communication. It is how we remember, learn, teach, and experience the world. Stories are often deeply personal, lived realities. So how can coming together to share stories help during this critical time for our earth’s climate system? How can storytelling foster the creation of and inform a just transition to a clean energy economy? 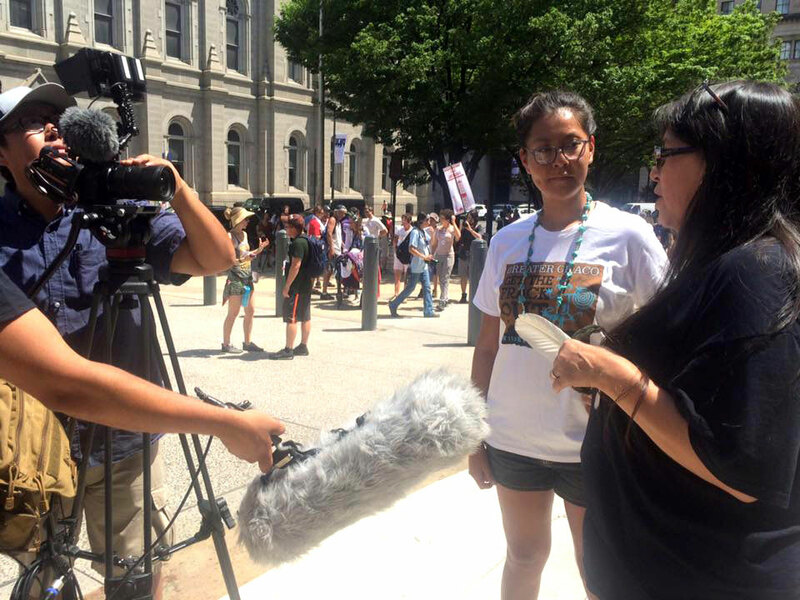 Some of the answers were revealed to me in July 2016, as I journeyed along with 23 other Indigenous and non-Indigenous advocates, activists, and community workers – from youth to elders – across the United States on the Protect Our Public Lands Tour: For a Just and Renewable Energy Future, a project launched out of the collaboration between the Livelihoods Knowledge Exchange Network (LiKEN), Food and Water Watch, Paper Rocket Productions, the Native American Producers Alliance, the Kentucky Environmental Foundation, the Intertribal Council on Utility Policy, and the Permanent Peoples’ Tribunal on the Human Rights Impacts of Fracking. The film and short clips that will emerge to help inform a just transition to a clean energy economy, will be primarily disseminated through our community, organizational, professional, and scholarly networks, which are a key LiKEN asset. The film can be a tool for partnering organizations to use in their trainings with communities and other organizations, it can be shown in classrooms and at community forums, and help build the scholar–community and science—people iterative process of translation and communication between different knowledge systems. While the stories shared were deeply local, what emerged during and after the tour was how stories could be leveraged through social media to build conversations, share knowledge, and create solidarity across cultures, communities, regions, and even nations. March for a Clean Energy Revolution, Philadelphia, PA. July 24, 2016. Photo by Julie Maldonado. I readily saw through my feed that my friends and colleagues had now become Facebook friends with other people who were on the tour, and that they were sharing each other’s posts. That is not particularly spectacular itself. But what is significant is when an Indigenous activist on the tour posted about resistance efforts in North Dakota against the $3.8 billion Dakota Access pipeline, which would carry half a million barrels of Bakken crude from North Dakota to Illinois, threatening Standing Rock Indian Nation’s water sources, land, and health. In those two words – in solidarity – their stories were tied together, linked across cultures, time zones, histories, and geographic boundaries. They were connected, no longer in isolation. There is no quantified result of this type of journey and collaborative efforts. There is however, knowing that thousands of miles apart we can be present within a common struggle. With a grounded foundation, we can leverage these efforts to build awareness, share knowledge, and stand in solidarity across cultures, communities, regions, and even nations, to infuse environmental justice into the transition to a post-carbon, clean energy economy.